The Seneca Falls Convention, which is perhaps best remembered for its demand for women’s suffrage, was held on July 19, 1848. And yet 169 years later, American women continue to struggle within the confines of a patriarchal and misogynistic society—and to honor the legacy of the Seneca Falls Convention nonetheless by continuing to fight for their rights. 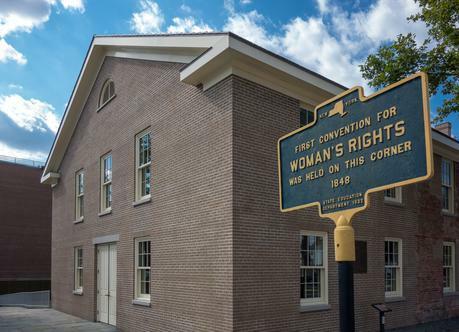 The convention produced an influential feminist document called the “Declaration of Sentiments,” which highlighted the ironic lack of freedom women had in their country given their nation’s founding document and overall purpose. As the Declaration of Sentiments pointed out, “the history of mankind is a history of repeated injuries and usurpations on the part of man toward woman, having in direct object the establishment of an absolute tyranny over her.” Attendees of the Seneca Falls Convention signed the Declaration of Sentiments just as the founding fathers had signed their own declaration, although only one signer of the Declaration of Sentiments lived to see the passage of the Nineteenth Amendment, which allowed women to vote, in 1919. But while the Seneca Falls Convention is a significant event in the history of American feminism, it is certainly worthy of criticism: it did not directly address the plight of women of color, particularly the beatings and rapes suffered by female slaves throughout the 19th century. Although Elizabeth Cady Stanton (who notably later opposed 15th Amendment because she believed women should take precedent over slaves), Lucretia Mott, Martha Wright, and Mary Ann M’Clintock—who are credited with organizing the Seneca Falls Convention—were active abolitionists, women of color were still largely excluded from voting in the U.S. until the passage of the Voting Acts Right of 1965. And yet despite the resistance women faced in their attempt to secure the right to vote, the number of women who have voted in every presidential election since 1980 has exceeded the number of men. This is true across all races and ethnicities, with one exception: among Asian/Pacific Islander voters, men vote at a slightly higher rate than women. The March based on this agenda was the largest single-day protest in recorded United States history, and this widespread support of such ideas exemplifies how the American feminist movement has progressed and must continue to progress. For over a century, American women have stood up to institutional systems of oppression. But now, instead of focusing on the lives of white women, like the Seneca Falls convention did, the Women’s March highlights the importance of intersectionality. The Seneca Falls Convention anniversary is a reminder that while the feminist movement has come a long way, we still have work to do and progress to make—within our ranks and beyond them.